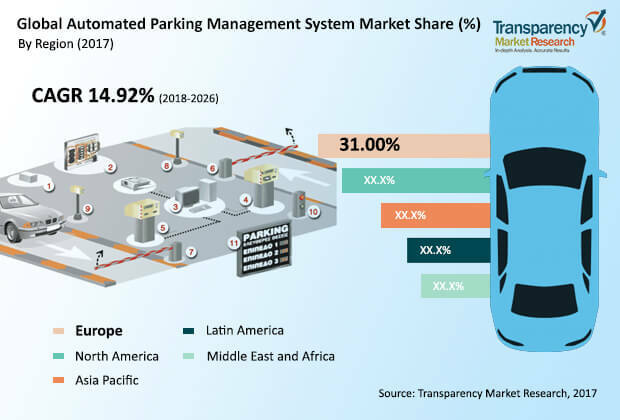 The global automated parking management systems market is markedly fragmented as each regional market can have different players holding prominent positions, notes Transparency Market Research (TMR). For instance, Skyline Parking and CityLift are expected to emerge as leading players in Europe and Asia Pacific. In North America, the top players are Robotic Parking Systems, Inc. and CityLift who hold a combined share of upward of 32.0% in the regional market. TMR finds that some of the other prominent players operating in the global automated parking management systems market are EITO&GLOBAL INC., Round Automated Parking System, Klaus Multiparking Systems Pvt. Ltd., Dayang Parking Co. Ltd, and Unitronics. TMR observes that top players are entering into mergers and acquisitions with other prominent players to strengthen their positions in the market. Top players are capitalizing on their robust geographic presence and a wide product portfolio to stay ahead of others. A growing number of players are also leveraging the potential of synergies they have with regionally prominent players, with an aim to consolidate their shares. The global automatic parking management system market is projected to rise at a CAGR of over 13.00% from 2018 to 2026 and touch a valuation of US$4.5 billion by the end of 2026. The various regional markets for automated parking management systems are the Middle East and Africa, North America, Latin America, Europe, and Asia Pacific. Of these, North America held the major share in 2017, vis-à-vis revenue, and is expected to retain its dominance throughout the assessment period. The various technologies deployed in automated parking management systems are sensor technology, mobile technology, and RFID. Among all the types, the demand for sensors is expected to rise at a substantial pace over the forecast period. The rapid strides made by industrialization in suburban areas is a notable factor catalyzing the burgeoning demand for automated parking systems. The demand for automated parking management system emanates from the ever-rising need for more parking space for vehicles given the staggering rise in new registrations all over the world. The demand for technologies and systems for optimizing parking space is a key factor propelling the growth of the global market. The exponential rise in number of vehicles in urbanized spaces of developing and developing nations is a key factor that has squeezed the available parking space. With the pressing need for minimizing the land usage, the problem has been confounded further, thus fueling the demand for automated parking management systems. Numerous benefits of automated parking systems reinforce the attractive demand, key of which are doing away with driving lanes, ramps, optimizing the land usage, ensuring the minimal pedestrian traffic. Furthermore, since the hassles of parking that people face has been a prominent factor contributing to traffic congestions in urban spaces, the need for reducing them has been bolstering the demand for automated parking management systems. The swift pace of urbanization in emerging economies and a large part of population moving to central business districts are notable factors catalyzing the demand for automated parking management systems. The demand is bolstered by the role of automated parking system in simplifying the administrative operations and in improving the surveillance and security of all types of vehicle in the parking arena. Moreover, advancements in anti-collision technologies are also boosting the market. The global automated parking management systems is likely to reap potentially lucrative gains from advances made in car parking management and monitoring technologies. This is evident especially in developed nations. The market is garnering gains from the constant advances being made in automated parking systems. Rapid technological advances being made by sensors and neural networks are fueling the expansion of the market. The growing focus of governments, especially in several emerging economies, on smart city infrastructures is a notable factor fortifying the demand for automated parking management systems. The rise in number of financial districts in recent years, notably in Asia Pacific, has accentuated the overall market. The study presented here is based on a report by Transparency Market Research (TMR) titled “Automated Parking Management Systems Market (Mode of Automation - Semi-automated Parking System and Fully automated Parking System; Technology - Sensor Technology, Mobile Technology, and RFID Technology; End Use - Residential, Commercial; Service & Solution - Integrated Payments, Vehicle Detection Solutions, Space Reservation Services, and Monitoring & Reporting Services; System – Software and Hardware) - Global Industry Analysis, Size, Share, Growth, Trends, and Forecast 2018–2026”.